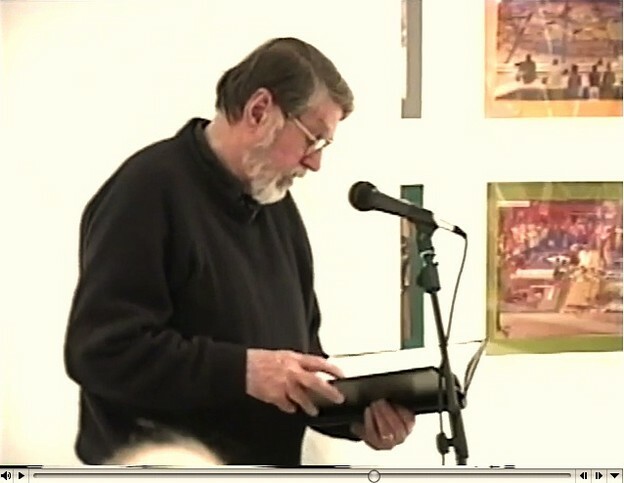 A beautiful late reading given by Robert Creeley, CUE Art Foundation, January 18, 2005. We at PennSound provide the video and also the audio-only recording of this event. "When I think of where I come from....of what a life is, or was...," begins the first poem in the reading. Creeley died in March of '05, just a few months later. 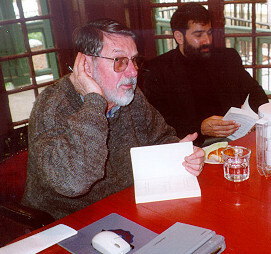 Note: Robert Creeley was a Kelly Writers House Fellow in April 2000. 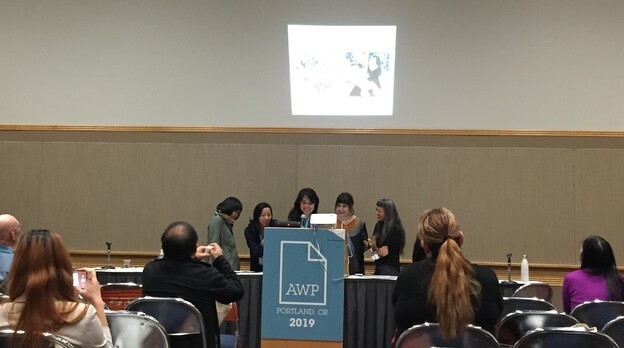 I conducted a public interview and moderated a discussion on April 11 before an audience of eighty people. The recording (both video and audio) of the interview has been available both on the Kelly Writers House site and at PennSound. Recently Michael Nardone transcribed it. We expect to publish the entire transcript in Jacket2 before too long. Meantime, below we present the portion of the discussion in which I ask Creeley about William Carlos Williams. Al Filreis: Now back to Williams, your initial response to Williams — according to something you said at Camden in December  — was that what mattered to you in reading Williams, particularly The Wedge, was that the work was driven by anger. This is what, at least, Ron Silliman posted to the Buffalo poetics listserv afterwards. And then he went on to comment on how Williams had a huge impact on him as well, but it was a very different Williams. So, if anger is not quite operating as much, what’s your Williams now? How does Williams animate you now? 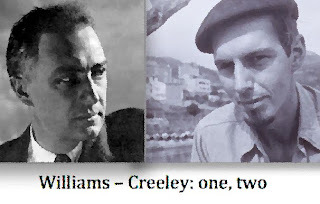 Robert Creeley: Back to Ron’s point, that that wasn’t the Williams he read, he reads the later Williams. Creeley: Yeah. Which is not an unangry poem, so to speak. But it certainly isn’t nearly as angry as the poems he was writing in the thirties or twenties. Spring and All, for example. 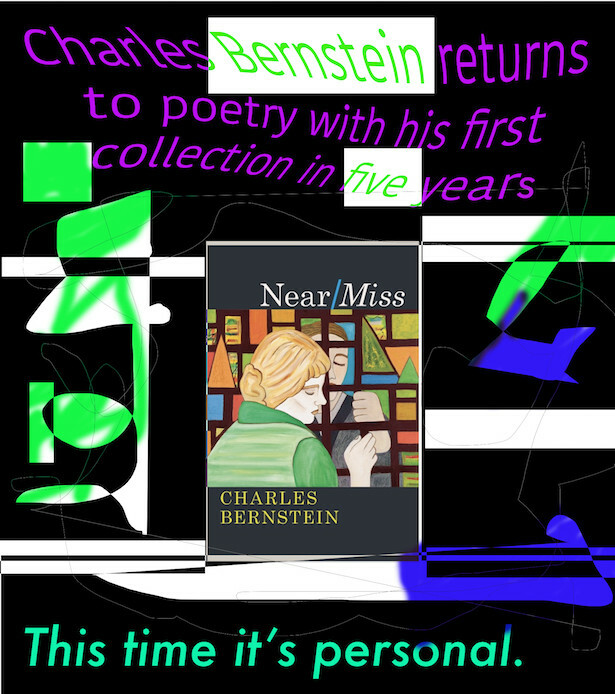 Or The Descent of Winter, or “March First.” Many of the early poems are really angry, and their emotional base is their revulsion and anger at the world he finds around him. 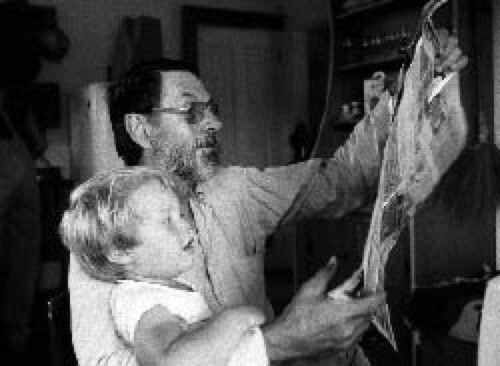 Creeley: Well, it feels very much like my own life. I, when young, felt a dismay, let’s put it, that such things as the Holocaust or the Second World War or the Depression or many other factors in one’s real life, that these could be so unremarkable to the body politic, that it seemed not to matter. Now back to Williams, your initial response to Williams — according to something you said at Camden in December  — was that what mattered to you in reading Williams, particularly The Wedge, was that the work was driven by anger. This is what, at least, Ron Silliman posted to the Buffalo poetics listserv afterwards. And then he went on to comment at how Williams had a huge impact on him as well, but it was a very different Williams. So, if anger is not quite operating as much, what’s your Williams now? How does Williams animate you now? Back to Ron’s point, that that wasn’t the Williams he read, he reads the later Williams. Yeah. Which is not an unangry poem, so to speak. But it certainly isn’t nearly as angry as the poems he was writing in the thirties or twenties. Spring and All, for example. Or the “Descent of Winter,” or “March First.” Many of the early poems are really angry, and their emotional base is their revulsion and anger at the world he finds around him. So, now when you look back at Williams, how does it feel? Well, it feels very much like my own life. I, when young, felt a dismay, let’s put it, that such things as the Holocaust or the Second World War or the depression or many other factors in one’s real life, that these could be so unremarkable to the body politic, that it seemed not to matter. Who's counting? Well, but...Who's counting? Well, but... Here are the most often listened-to PoemTalk episodes in the last two weeks: 1) W. C. Williams, 2) Robert Creeley, 3) Wallace Stevens, 4) Jaap Blonk, 5) Cid Corman, 6) Allen Ginsberg singing Blake, 7) Amiri Baraka, 8) Ezra Pound, 9) Barbara Guest. I'm not counting the new Vachel Lindsay show; it received the largest number of hits but was just released, so its traffic resulted in folks responding to a widespread announcement. We'll see next month if people are still listening to the Lindsay. I certainly hope so. Robert Creeley, "I Know a Man"
Robert Creeley's "I Know a Man" is in many ways a signature poem. Few poems we choose to discuss on PoemTalk are such. Many are downright unrepresentative. This one might indeed be unrepresentative but if a person knows just one Creeley poem this is probably it. It's been much written about. In The San Francisco Renaissance Michael Davidson explores the "Beat ethos" with a detailed reading of "I Know a Man." Similarly, PoemTalkers Randall Couch, Jessica Lowenthal and Bob Perelman find beat here--but also its counterargument, and/or a rejoinder to its dark depth and to the beat propensity for driving nowhere (or somewhere) fast. Robert Kern in boundary 2--a 1978 essay--finds postmodern poetics in the Creeleyite anthem: in a nutshell, composition as recognition. Cid Corman (himself the topic of an upcoming PoemTalk) finds and commends the "basic English" of the poem, comparing it with a "more refined" and less effective poem on a similar topic by Louis MacNeice. Walter Sutton back in '73 drew a line of influence from Charles Olson's poetics to Creeley's "laconic" and "spasmodic" lineation and rhetoric. The PoemTalkers talk about this remarkable instance of eloquent stammering. The stammer is perhaps the apt way--since form is never more than an extension of content, and vice versa, after all!--of heading into the surrounding mid-1950s darkness, only to be brought up short by the actual needs of the actual American road. It is not a resolution and not a capitulation, but an assertive and possibly ironic (funny, anyway) means of bringing up short. Or, in short: more stammering. Our friends at the Poetry Foundation have listed and linked all episodes of PoemTalk here. And, as always, one can subscribe to PoemTalk through the iTunes music store; simply type "PoemTalk" in the Music Store search box. 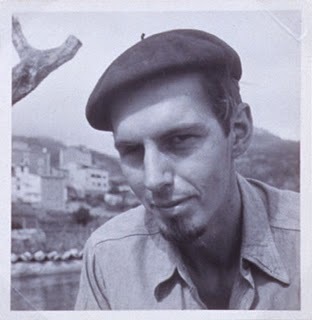 There are, at last count, eight different recordings of Creeley reading this poem - all to be found, along with much more, on PennSound's Creeley author page. Not long after his father's death, Will Creeley brought to us boxes of reel-to-reel tapes, which we have gone through carefully, digitizing, segmenting, identifying poem by poem.